Attendees face the U.S. flag that flies outside the Wilmington Municipal Building during a 9/11 remembrance Tuesday. 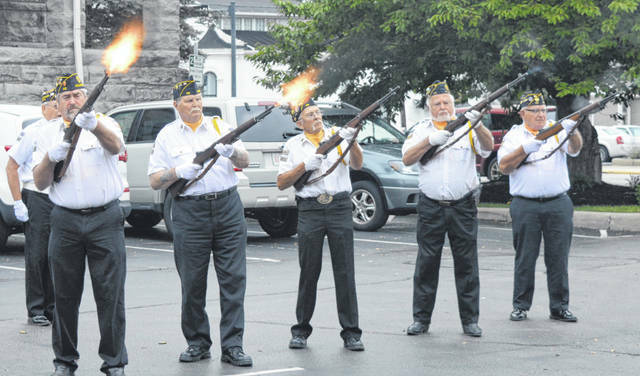 The American Legion Post 49 Memorial Squad (two squad members are not visible) presents a 21-gun salute. 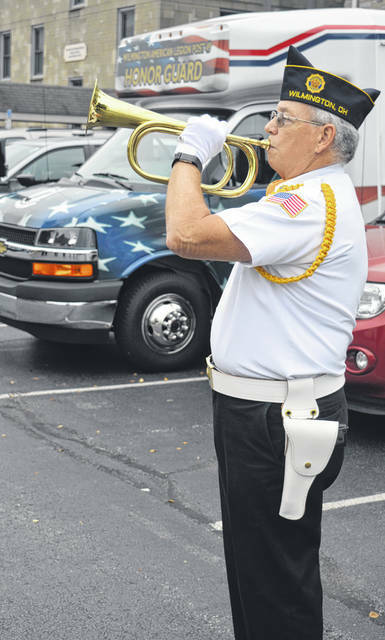 Michael Sutton with the American Legion Post 49 plays “Taps”. 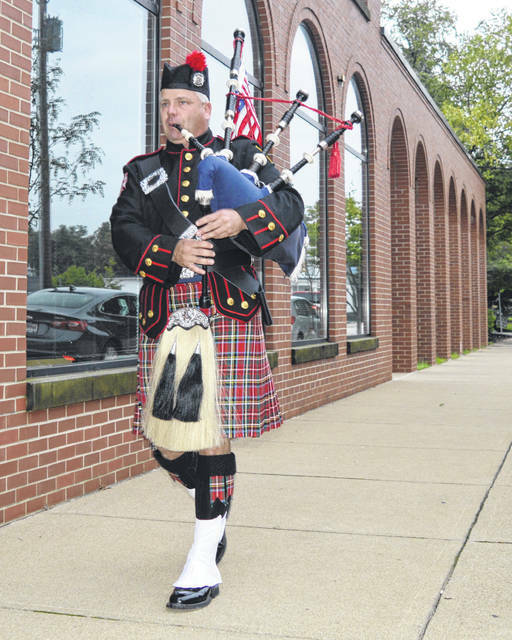 To conclude the local commemoration of 9/11, Wilmington Fire Department Lieutenant and piper Ed Meyers walks away from the assembled crowd, so that it seems to them the music fades out. The commemoration featured a tolling of the freedom bell by Clinton County Commissioner Brenda K. Woods, a 21-gun salute by the American Legion Post 49 Memorial Squad, the singing of the National Anthem by Emily Walls, the playing of “Taps” by Michael Sutton, bagpipe music by WFD Lt. Ed Meyers, three speakers, and a lowering of the flag by the Wilmington Police and Fire Departments and the Clinton County Sheriff’s Office. Haley, who is a Clinton County commissioner and former county sheriff, noted the terrorists targeted symbolic landmarks when they attacked the Twin Towers in New York City and the Pentagon in the nation’s capital. Another speaker, Wilmington Assembly of God Pastor John Wirmel, said he was in training as a minister when the attacks occurred, and accordingly he and associates were at the Pentagon on Sept. 12 to serve and counsel those involved in the cleanup and relief efforts. During his remarks, Wirmel read two passages from the biblical book of Psalms. Spicer, who has assisted at the Murphy Theatre for years, recalled that a Branson-style production was being prepared for the theatre at the time of 9/11. The backdrop of the show was to include the Twin Towers and, after much discussion, the decision was to keep the two buildings on the backdrop in memory of those who were killed. When the show opened, the “crowd went crazy” with approval when they saw the Twin Towers still standing, said Spicer. Two speakers mentioned that presently there is a divide in the country, in contrast to the unity that followed 9/11. Spicer said Americans have more in common than they have in disagreement.